I was inspired by My Second Grade Journal and Mrs. T's First Grade Class to make revolving math cups! Styrofoam cups are great for place value and greater than, less than, or equal to practice. Grab three styrofoam cups and write numbers 1-9 around the outer rim (opening facing left). Write one zero after each numeral for your tens cup and two following the numerals on your hundreds cup. Then, stack them! Kids can twist and turn the cups to create different numbers. Plus, this activity helps them understand numbers in expanded form (100 + 10 + 1 or 111). For older or advanced kids add thousands, ten thousands, hundred thousands, millions and so on! You could even add decimals and cover tenths, hundredths, and thousandths! For greater than, less than, equal to cups, simply grab a cup and add the symbols. 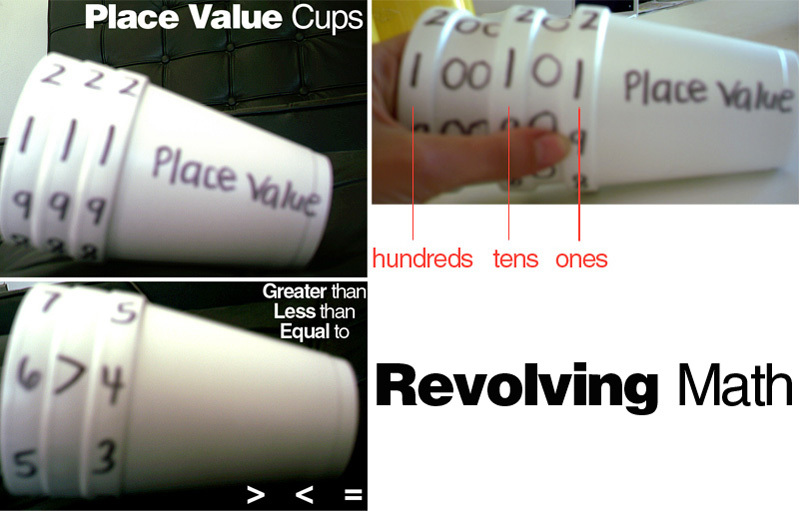 You can use the cups you made for place value with your symbol cup. Kids can practice comparing one digit numbers with each other. Then, switch the cups around and compare two or three digit numerals with one digit numerals! Mrs. T's First Grade Class also made word family cups and alphabetical order cups as well! Check them out here!